From its past, learn perfection. This is how the first model of the Lamborghini Huracán was born. More performance, more control, more innovation. With its 610 CV aspirated V10 engine and a maximum torque of 560 Nm, the Huracán can take you from 0 to 100 km/h in 3.2 seconds, reaching a top speed of over 325 km/h, while providing all the latest technology to perform at its absolute best. Engineered to guarantee the best performance and control under any driving condition, it's easy to take to the limit, not to mention extremely fun, thanks to technology like the Lamborghini Doppia Frizione (LDF) dual clutch gearbox and the electronically-controlled four-wheel drive. Enjoy the best driving experience, ever. Choose the tour, the Huracán will accompany you along the wonderful Motor Valley ... and beyond! All packages are based on n. 1 person. Briefing and Test Drive with co-pilot (tutor) of the BullBar Team. Customized Tours according to demand. Custom Tours to visit dairies, wineries, vinegar, Umberto Panini collection. 30 minutes Test drive around Sant'Agata Bolognese departing from Bullbar. Video recording with on-board camera. Guided tour Centro Eccellenza Lamborghini. first, second and side dish, water, a glass of wine, coffee. Test drive from BullBar (Sant'Agata Bolognese) to Pagani Automobili SpA (San Cesario sul Panaro) and back. Guided tour Pagani Automobili SpA factory. Test drive from BullBar (Sant'Agata Bolognese) to Ducati Motor Holding S.p.A. (Borgo Panigale) and back. Guided tour Ducati Motor Holding S.p.A. factory. Test drive from BullBar (Sant'Agata Bolognese) to Ferruccio Lamborghini Museum (Funo) and back. Guided tour Ferruccio Lamborghini Museum. Test drive from BullBar (Sant'Agata Bolognese) to Modena Racetrack (Marzaglia) and back. Technical briefing with an instructor pilot and demonstration video. Test drive on track with Lamborghini Gallardo Super Trofeo. Test drive from Bologna G. Marconi Airport to a Hotel in Bologna or Modena. BullBar, by Mycastle.it partnership, offers mansions and historic homes hospitality combined with test drives and tours with his own Lamborghini. Welcome cocktail at Castello Pignatti Morano in Modena. 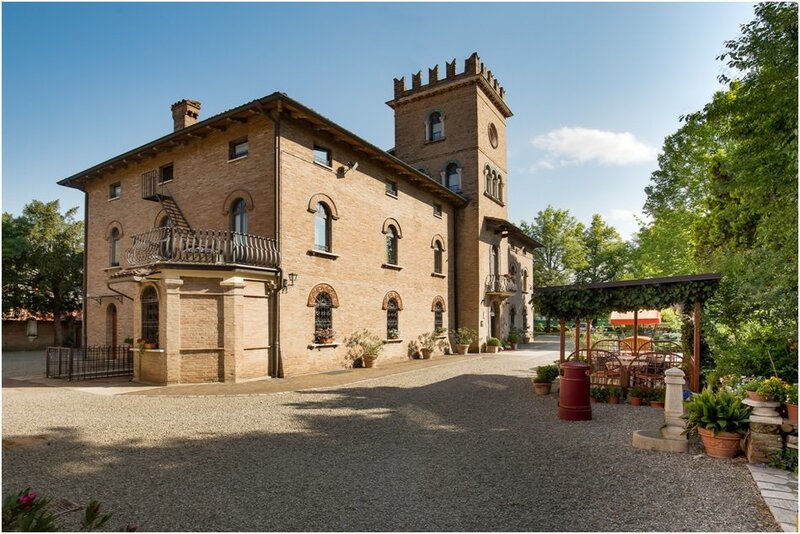 Bed and breakfast at Castello Pignatti Morano in Modena. Independent transfer by own car in Sant'Agata Bolognese. 30 minutes Test Drive (for a single person).